Join friends from the neighbourhood, dignitaries, Phoenix Winter (President, Carnegie Community Centre Association) and special guests for this the grand Opening Ceremony of our 12th annual festival! 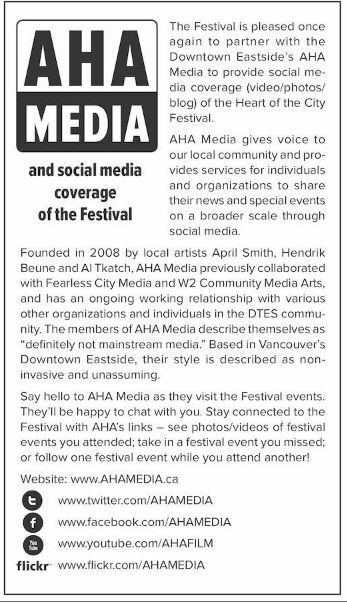 Today we celebrate the artists in our midst; the strength and resilience of the Downtown Eastside community; and the theme of this year’s Festival, Nourished by Community. William Nahanee (Kwel-a-a-nexw) of the Squamish Nation will open with a Welcome Song; DTES favourite Dalannah Gail Bowen and Owen Owen Owen will nourish our souls with their heart-felt music; Sylvi MacCormac will share her new soundscape on the Festival accompanied by a slide show of festival photographs; poet-extraordinaire Muriel Marjorie Williams will stir things up with trombonist Brad Muirhead; John Endo Greenway, Rosemary Georgeson and Grace Eiko Thomson will present an excerpt from Against the Current, along with a hopeful surprise! And the Hastings Street Band will have us ready to boogie with their toe-tappin’ hot jazz. 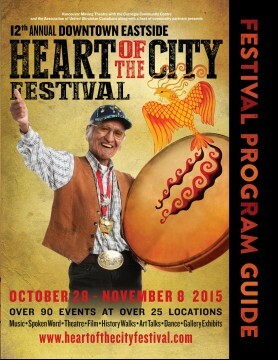 This event was on Day 1 of the 12 Days of the Heart of the City Festival. Please check the website for more events!